Cousins in Clay is a Show and Sale of Contemporary Ceramic Art. 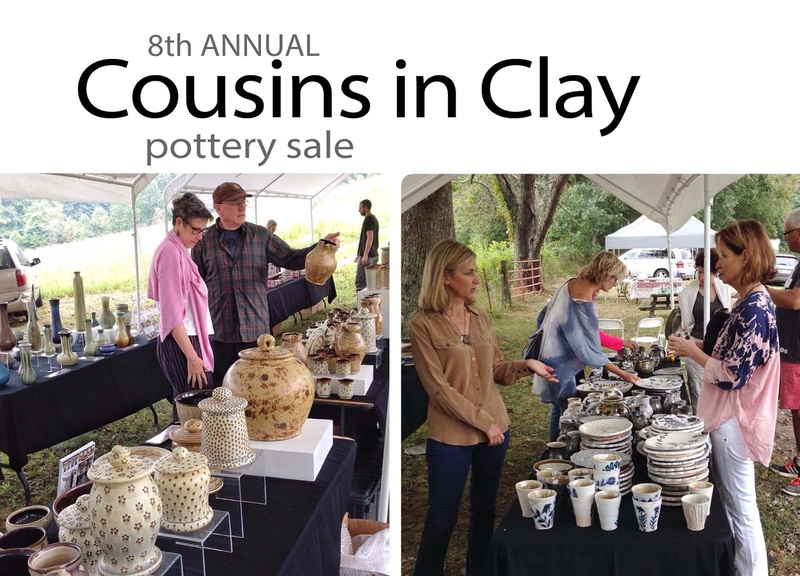 Cousins in Clay is a kinship rooted in a pursuit of excellence within the diverse language of pottery. Visit the mountains and add to your collection the beautiful work by our potters. 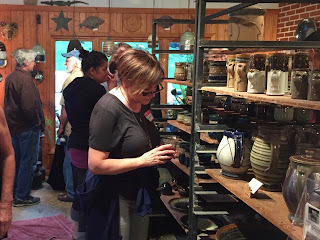 Come for the day or stay for the Labor Day weekend in the mountains of NC near Bakersville and enjoy great pottery, delicious woodfired pizza, and cold refreshments. This summer's guests are Troy Bungart and Kyle Carpenter, from Three Rivers MI and Asheville NC respectfully. 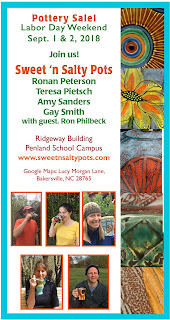 Live pottery demonstrations each day. All are welcome! The mountains of Western North Carolina heat up once again this Labor Day Weekend with the return of 10 Friends In Their Element: The Show and Sale in the Upper Gallery of TRAC in Spruce Pine, 269 Oak Avenue. 10 Friends will be September 1 and 2 10am – 5pm each day. On Sunday, join 10 Friends for a Jazz Brunch from 11:30am – 1:00pm with food and beverages by the Friends. 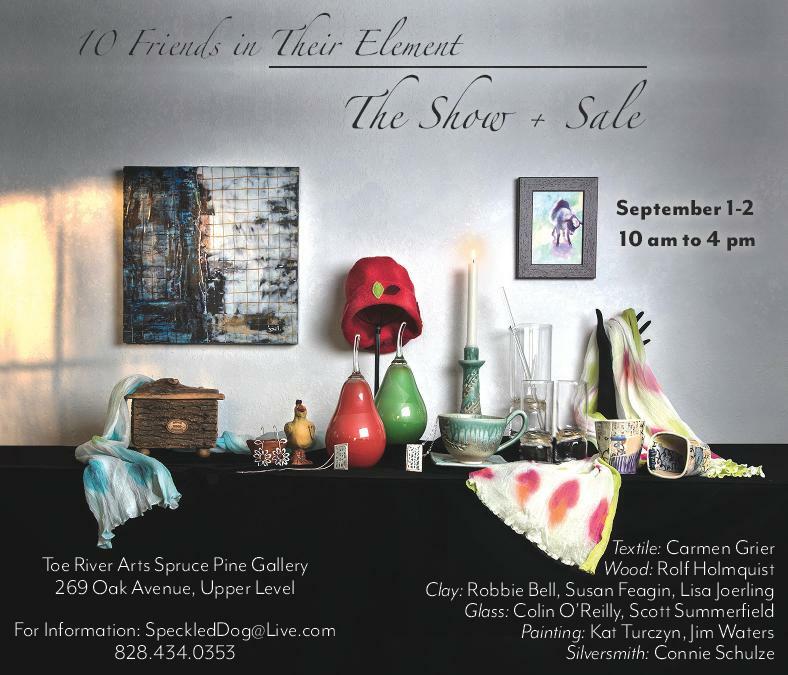 10 Friends In Their Element showcases the works of 10 artists that live and work in the Toe River area in the areas of clay, glass, fiber, jewelry, painting, and wood. This year, you will find potters Robbie Bell, Susan Feagin, and Lisa Joerling; glass blowers Scott Summerfield and Terrane Glass; fiber artist Carmen Grier; jewelers Lisa Joerling and Connie Schulze; painters Kat Turczyn and Jim Waters; and woodworker Rolf Holmquist. 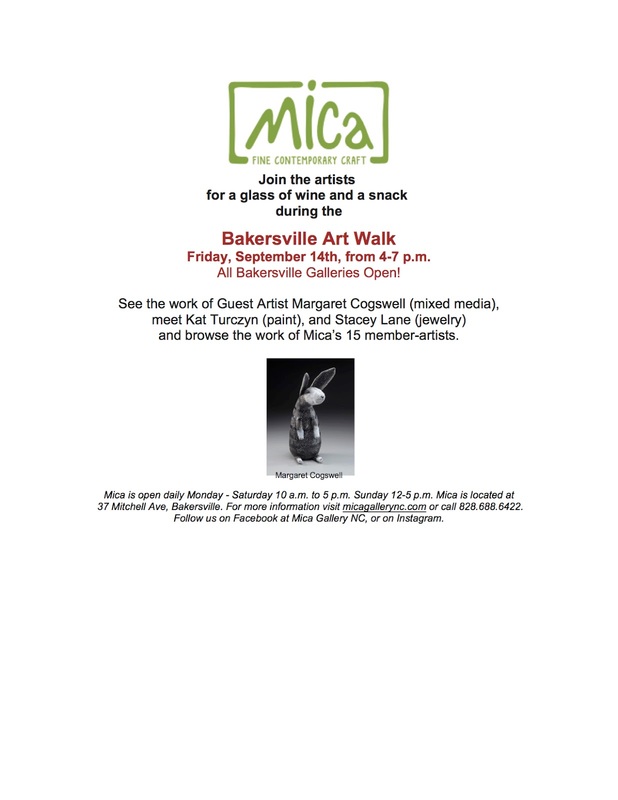 Join us at Mica for a glass of wine and a snack during the Bakersville Art Walk Friday, September 14th, from 4-7 p.m. All Bakersville Galleries Open! 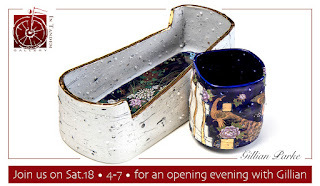 See the work of Guest Artist Margaret Cogswell (mixed media), meet Kat Turczyn (paint), and Stacey Lane (jewelry) and browse the work of Mica’s 15 member-artists. 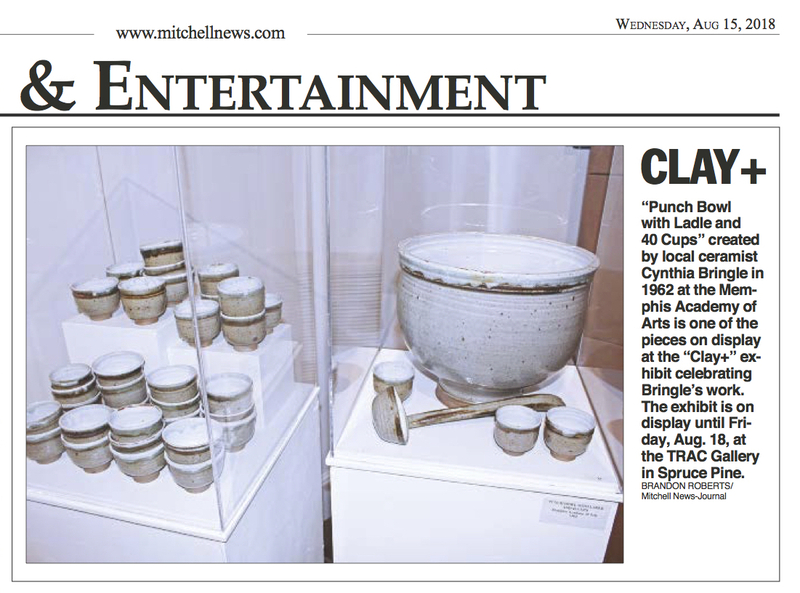 Mica is open daily Monday - Saturday 10 a.m. to 5 p.m. Sunday 12-5 p.m. Mica is located at 37 Mitchell Ave, Bakersville. For more information visit micagallerync.com or call 828.688.6422. 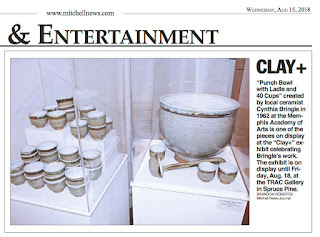 Follow us on Facebook at Mica Gallery NC, or on Instagram. 9/30/18 update: the kiln is still for sale. Marianne is willing to reduce the price to $1800.00, though with that price she cannot deliver the kiln. Marianne Hall from Blowing Rock is selling her kiln and wheel. See the attached pictures. Her note with kiln pricing is the last image. She is asking $400.00 for the wheel. You can reach Marianne at hall7015@bellsouth.net. She says "The kiln price is negotiable. When pricing it, I spoke with Maggie Black and she felt this was a good price. We would be willing to deliver free up to 100 miles." 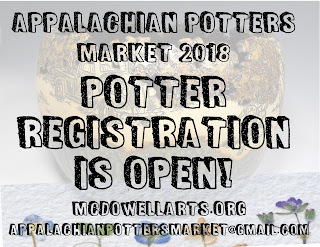 Applications are now being accepted for the 32nd Annual Appalachian Potters Market, which will be held in Marion, North Carolina on Saturday, December 1st. The market is sponsored and hosted by the McDowell Arts Council Association & The Blue Ridge Traveler. Homage is a body of work motivated by the marriage of classical ceramic form and the sensual properties of Crystalline glaze. 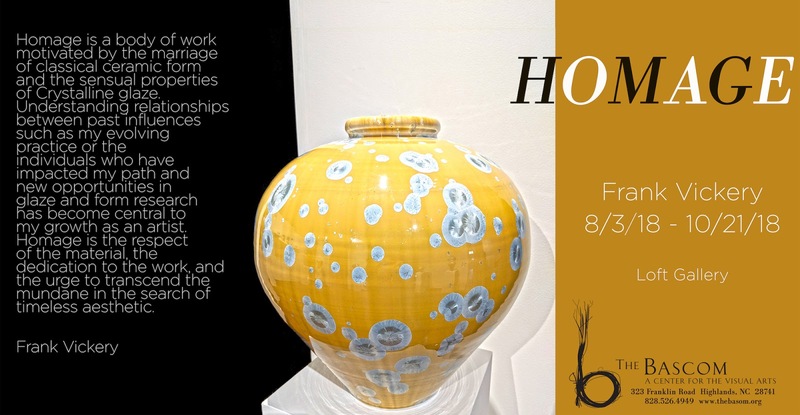 Understanding relationships between past influences such as my evolving practice or the individuals who have impacted my path and new opportunities in glaze and form research has become central to my growth as an artist. Homage is the respect of the material, the dedication to the work, and the urge to transcend the mundane in the search of timeless aesthetic. 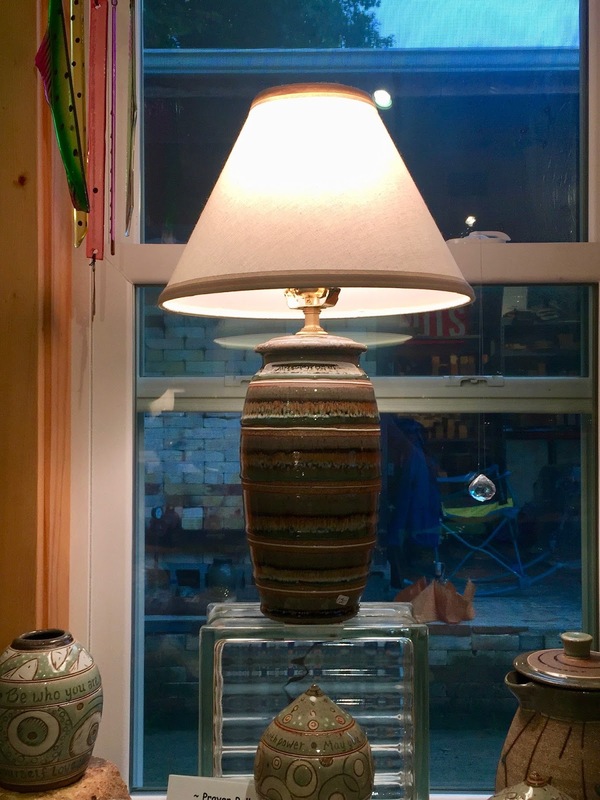 Linda Falcone is looking for an electric kiln, preferably small (around 18”, though she is open to a larger kiln if the price is right). She’s also looking for an electric wheel. Have a kiln, wheel or lead for Linda? Contact her at claymaster69@yahoo.com. Update: the spoon has been located. Thanks everyone! Hey clubbers - there is a spoon missing from August Clay Club at the Rutkowskys. It’s a serving spoon that was used by someone for their dish and Ruth is really hoping to get it back. Ruth describes it as a heavy, plain, stainless piece; large, shallow spoon, no holes/solid. If by any chance you ended up with it, please contact Ruth at rufisart@hotmail.com. Theresa Arrowood is looking for a kick wheel in or near Western North Carolina. If you have one or have a lead on one, contact Theresa at windyhillbp@gmail.com. 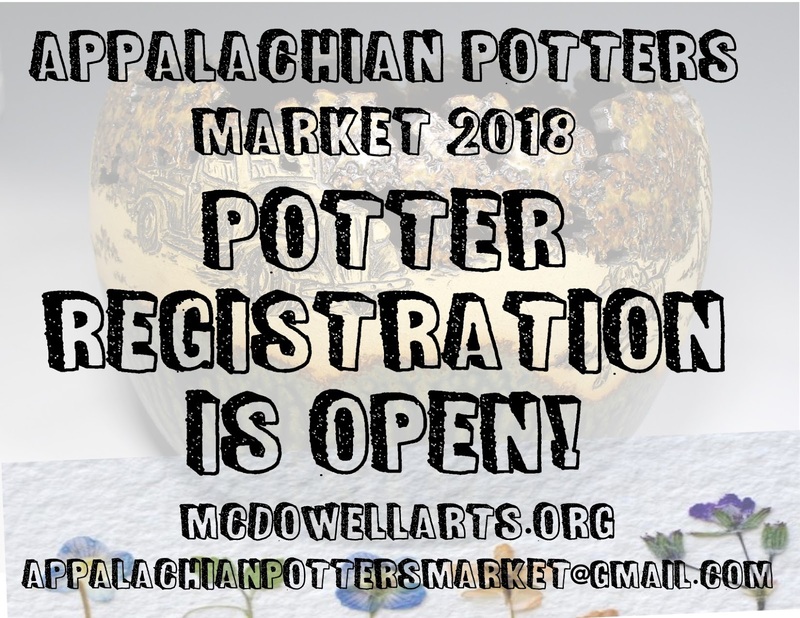 Calling all Potters! 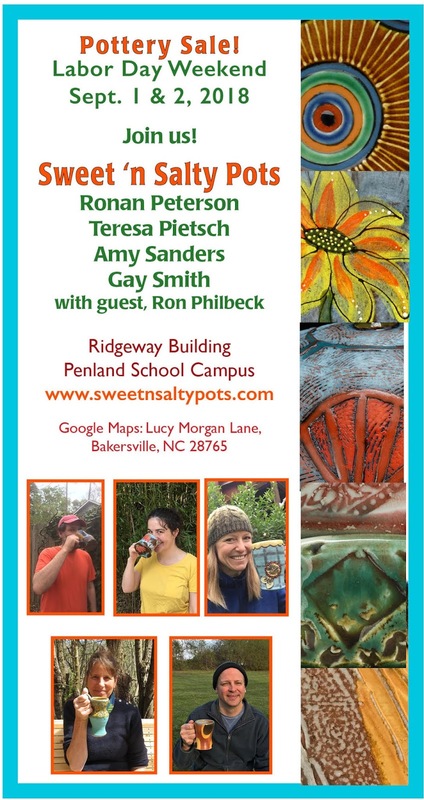 I am excited to share our annual Pottery Event will take place within our Fall Festival. The festival will be held in Chestnut Square Park and include a lineup of entertainment…all will enjoy! Local bands, dancers, performers and POTTERS filling the park with beauty. Food court, wine garden, beer tents, artisans, lawn games. You name IT…this event has IT!!! If you attended Family Fun Day this June, you know the crowd Indian Trail Events draw! Save the Date! Register now- Before ITs too Late!!! Visit our page to see why EVERYONE ♥️‘s IT!!! ** Potters will all be located within the same quad. If additional space is needed please feel free to give me a call and I will accommodate as available. INSTRUCTORS- what a perfect day to showcase your students! Crowds of compliments building confidence and success!!! Vendor information and application available on line or register in person at Indian Trail Town Hall, 315 Matthews Indian Trail Rd, Indian Trail 28079. Thank you in advance, for sharing your talents and providing our residents the resource to see and purchase your art. I cannot wait to see all the new and interesting designs clayfully decorating our PARK this year! 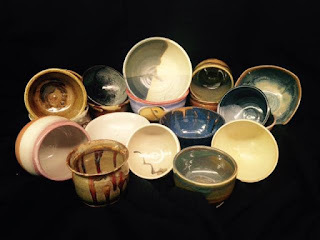 Mitchell County Shepherd’s Staff will hold its Empty Bowls dinner on Saturday evening, August 18th 5:00 pm-7:30 pm, at First Baptist Church in Spruce Pine, 125 Tappan St. For a $25.00 donation you will sample some of the best soups Mitchell County has to offer, in addition bread, non-alcoholic beverages and desserts will be served. Each guest will select a hand thrown “empty bowl” to keep as a reminder of all the empty bowls in Mitchell County and all around the world. All money raised at this event will be donated to Shepherd’s Staff to support its effort to end hunger in Mitchell County. Please join us for an evening of good fellowship and help feed a neighbor. The first time I saw this work I was honestly blown away. In my opinion, Gillian Parke's creations are the epitome of high elegance - but with an edge. She uses this wonderful porcelain clay body and then mixes in big and rough feldspar particles to it; also known as 'Chicken Grit' if you've done some farming... See that contrast I'm talking about? She then applies underglazes, wax resist, glazes, decals, multiple types of lusters, overglazes.... then, fires a bunch of times for each layer and viola; absolutely gorgeous pieces come out. Come to Leicester Studio Tour this weekend! For the 13th year in a row, artists in this small community will open their studios to the public for the annual Come to Leicester Studio Tour. This free, self-guided event is held every third weekend in August, with this year’s tour dates being August 18 and 19, 10 a.m. – 6 p.m. each day. Visitors will be able to view unique, hand-crafted work, see how it’s made first hand, and even purchase a piece that can be taken home and treasured for years to come. 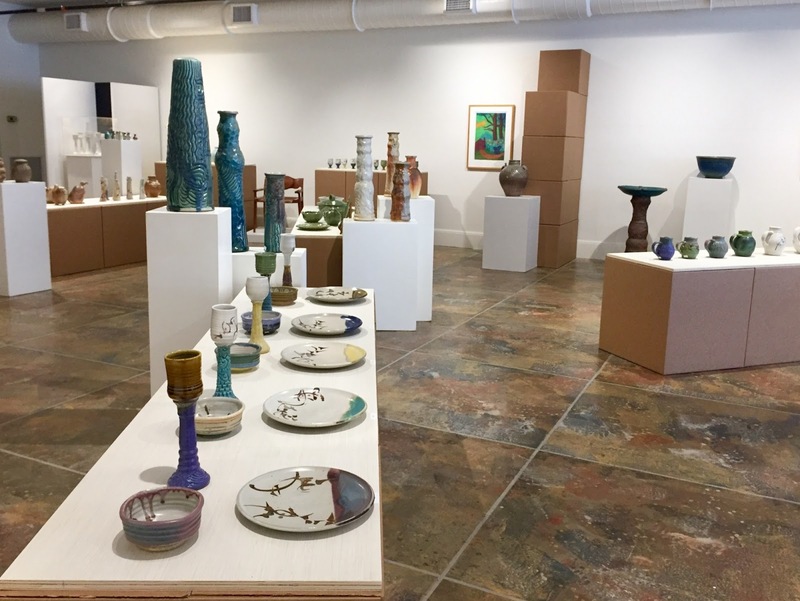 Leicester Tour artists are comprised of both local and visiting artists from nearby communities, and make work in a variety of media including clay, fiber, jewelry, metal, mixed media, natural materials, painting, and wood. This means all manner of fine art and craft may be found, including brooms, furniture, pottery, iron work, turned bowls, quilts, wearable art, and much more. As they make their way along the tour stops, visitors may once again choose to participate in a raffle. Each artist has a code at their studio which guests can write on a scorecard they’ve been given, and drop off at a designated location when they have completed the tour. This year there are a number of prizes, and they are all wonderful works of art donated by some of the participating artists. In addition to being one of the stops hosting a handful of artists, Addison Farms Vineyard will be offering wine tastings, and for those who get hungry along the way, lunch may be enjoyed at one of the food sponsors on the tour. The Burger Stop, Gossett’s Grocery and Deli (only open Saturday), and Turkey Creek Grill will all be welcoming tour visitors, and can be located on this year’s map. 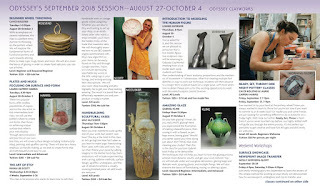 Leicester artists this year include Elizabeth Albright, Wesley Angel, Frank Barbara, Valerie Berlage, Marlow Gates, Pat Gentilella, Trish Golay, Jean Hord, Cat Jarosz, Beth Hampton Jones, Matt Jones, Dort Lee, Michelle Liepold, Sandra LoCastro, Deanna Lynch, Patrick McDermott, Nirado, Mike L Robinson, Jessica Sanchez, Steve Schroeder, Kay Smith, Anita Walling, Kathleen Weir-West, Joanna White, and Brad Worden. The Come to Leicester Studio Tour has, over the last thirteen years, proven to be an enduring tradition, enjoyed equally by the artists and the community in which they live, work, and serve. Visit www.cometoleicester.org or @ComeToLeicester on Facebook for more information about the artists and sponsors, directions for the raffle, and map. The Clay+ exhibit of Cynthia Bringle’s work at the Toe River Arts Council gallery in Spruce Pine is terrific - if you haven’t seen it yet, you have till this Saturday, August 18th. Highly recommended - go see it! Mission Health, in partnership with EL Design Studios & Gallery VI, is recruiting all artists, galleries and art organizations for work that may be considered for purchase and display at the new Mission Hospital for Advanced Medicine. Artists are invited to submit both 2D and 3D work, with an emphasis on nature and/or culture inspired art. Artwork can be readily available for purchase or an artist may be open to possible commissions. Purchases will be chosen by a Steering Committee, a panel of Mission leadership, who are charged with selecting pieces that reflect the unique art community and culture of the region. Up to 10 images of available work or sold pieces that could potentially be commissioned. Please indicate if artwork has been sold. Image Description (not to exceed 500-characters per image). Please describe your work samples by including title, year made, medium, dimensions, and wholesale price. Include any necessary packaging and shipping cost for each artwork (as a separate line item) in the image description. Artist’s Statement (not to exceed 2,000 – characters). Please write a brief description of your artistic intent. Biography (not to exceed 1 page). Resume (not to exceed 1 page). We have 300lbs of Highwater Redstone 06-02 FREE to good home. It is a bit stiff ....rags and water in plastic bags will soften it. Contact me at Tipottery@gmail.com or call 828-337-0992. Can be picked up at our showroom in Old Fort 2 and 1/2 miles S of I-40 exit 73. Here’s how they start the answer to the question, what is #EqualityClay? #equalityclay is a call to action. Our intention is to promote a dialogue of inclusion and diversity in the ceramics community. 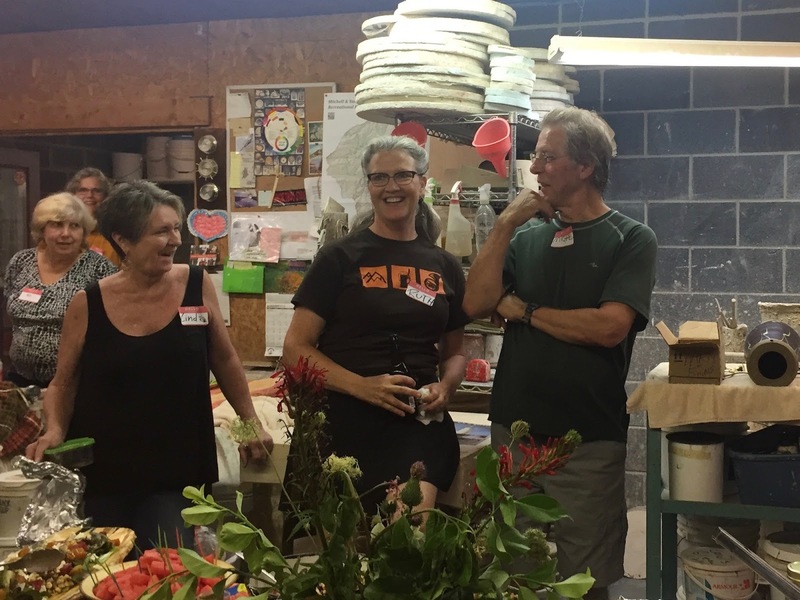 The hashtag #equalityclay was created in response to growing community movements of outreach, responsibility, and accountability among ceramic makers, educators, businesses, and other organizations. Our goal is to use our brand and social media to establish a network of people with similar social activism interests and to initiate specific dates for localized discussions of allyship. Together, we are stronger. Read more on their website: https://equalityclay.com. The website also includes a listing of Equality Clay Day events. There was an Equality Clay Day event scheduled to take place in Asheville, but it apparently has been canceled. There was another North Carolina event that also appears to have been canceled. It looks like the closest event currently listed is at MudFire in Decatur, Georgia. 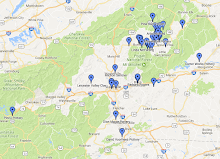 Does anyone know if there’s a closer Equality Clay Day event happening in or near Western North Carolina? Meanwhile, NCECA just today released a “Statement on Harassment.” The statement is unsigned. It was posted by Joshua Green, Executive Director. It doesn’t mention Eric Landon or Equality Clay Day. The statement mentions that NCECA has established an email address (reports@nceca.net) to “enable members of our community to share, in confidence, reports of harassment that may occur and impact our programming and decisions as an organization.” It also states that they hope to address this issue at the NCECA conference in Minneapolis in March, 2019. The accusations against Eric Landon aren’t the first in professional ceramics or even the first since the larger #metoo movement began last fall (see, for example, this story about accusations against Felt + Fat ceramic design studio co-founder Nate Mell from November, 2017), but it does seem that they have contributed to the ceramics profession having this #metoo moment right now. Here’s hoping this moment and movement can continue to shine light on this issue and help lead to change where needed. I'm submitting the following for a friend I worked with last year on the first Ferment Fest in Marshall -- it was a blast and very successful. Meg is looking for potters that sell work related to fermenting: bowls and crocks. I am writing to invite you to participate in this years' 2nd Annual WNC Fermenting Festival! Our festival was incredibly well attended last year and we were able to garner lots of media attention for our efforts. Including articles in the Mountain Express, WNC Woman Magazine, Bold Life Magazine and Edible Asheville Magazine. We are working hard and we are very excited about this years’ event and have been already generating lots of interest and advertising venues. We were able to bring together 27 various vendors and 8 demo instructors! This got us between 700-1000 bottoms in the door last November 5th. (I lost count at 750 but several eyewitnesses suggest closer to 1k attendees!) We had 5 vendors sell out completely and several more came very close! We had attendees from 6 neighboring states and generated over $700 in cash donations to the Beacon of Hope Food Pantry. Contact Meg at fermentifoods@gmail.com for Vendor Application Forms. Last year, we were able to raise $700 for the Beacon of Hope Services (Food Bank). Our goal for this year is $2000! And we can easily achieve this. For this year’s event, we will be widening our advertising efforts, expanding our FREE Demos and adding more items to our Raffle! If you would like to donate anything to the raffle please email me. Demos: Demos are TBA and if you would like to offer a Demo, lmk ASAP! *No Refunds will be given for cancellations after Oct 1st. *All funds raised during the event through the raffle, donations and surplus operating costs will be donated to the Beacon of Hope Food Bank. We look forward to hearing from you and please send a logo, promo pictures and a short promo “blurb” about your company, along with your application(s) so we can get started asap on your promotion! 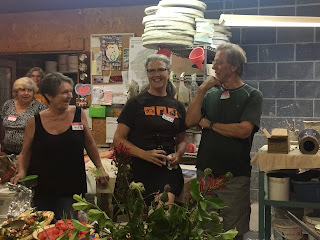 Thanks to Ruth and Michael for an awesome Clay Club at Rutkowsky Pottery! It was great to see everyone who came despite the rain (and the massive power outage in Asheville!). And it was terrific to see the Rutkowsky Pottery studio and gallery - what a sweet setup in a beautiful location. Michael did a detailed demo of wiring a ceramic lamp. He has been making lamps for about twenty years and has definitely developed a system for it. (As Ruth said: he makes it look easy.) He throws lamps the size he demoed in two pieces and then joins them, and throws the finials off the hump. He shared some useful tips (like, for example, the switch should be on the opposite side from where the cord exits the lamp). He gets parts from W.N. deSherbinin (https://www.wndesherbinin.com/) and lampshades from Shade Designs in Kentucky. The diagram pictured below shows the W.N. 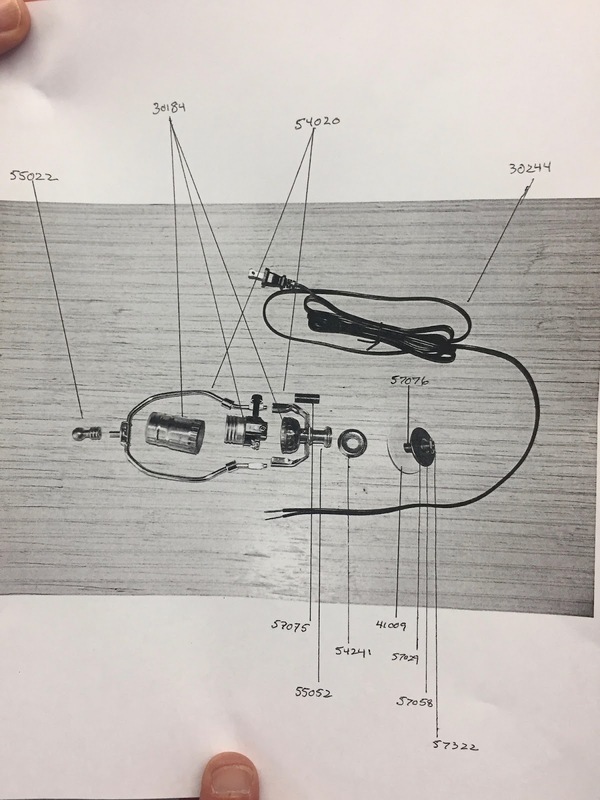 deSherbinin parts he uses. After the demo, we got to wish Michael a Happy Birthday and enjoy the birthday cake. Michael got help from other August birthday celebrators in blowing out the candles. Thanks again to Ruth, Michael and everyone who came! 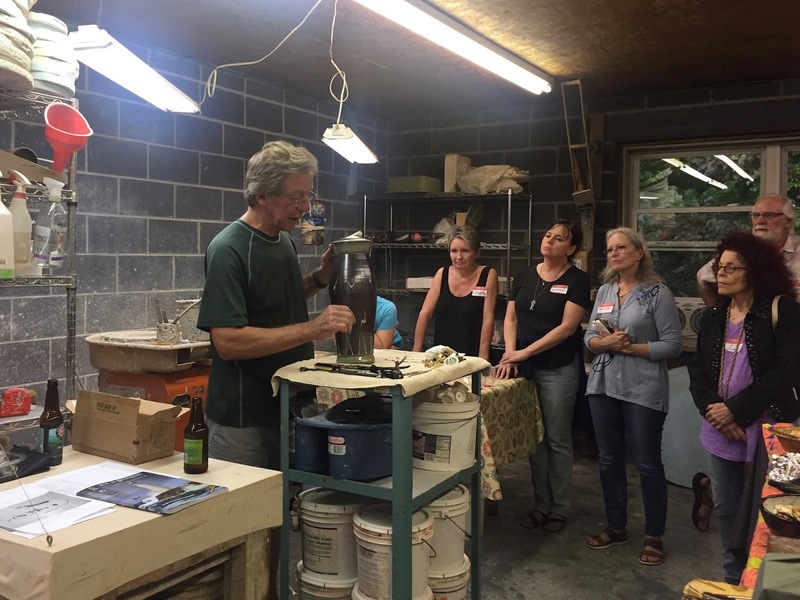 September Clay Club will take place at our regular second Wednesday time, from 6-8 pm on September 12th, at Maud and Austin Boleman’s Black Mountain Studios. I’ll share more info closer to the date. I’m retiring, after 50+ years as a studio potter. I also have two electric kilns, many glaze chemicals and a couple of tons of dry clay to sell or dispose of. Searching the book at Google Books brings up only a few references to the use of silica in ceramics (“ceramic” and “ceramics” show up on just two pages each and “pottery” on just one). Glass appears to have a bigger presence (“glass” shows up on 69 pages). GLOVER IS A recently retired geologist who has spent decades hunting for valuable minerals in the hillsides and hollows of the Appalachian Mountains that surround this tiny town. He is a small, rounded man with little oval glasses, a neat white mustache, and matching hair clamped under a Jeep baseball cap. He speaks with a medium‑strength drawl that emphasizes the first syllable and stretches some vowels, such that we’re drinking CAWWfee as he explains why this remote area is so tremendously important to the rest of the world. Spruce Pine is not a wealthy place. Its downtown consists of a somnambulant train station across the street from a couple of blocks of two‑story brick buildings, including a long‑closed movie theater and several empty storefronts. Wednesday afternoon update: Just a note to let everyone know that despite the widespread power outage in Asheville, the power is on at Rutkowsky Pottery and Clay Club is on for this evening. Hope to see everyone there! 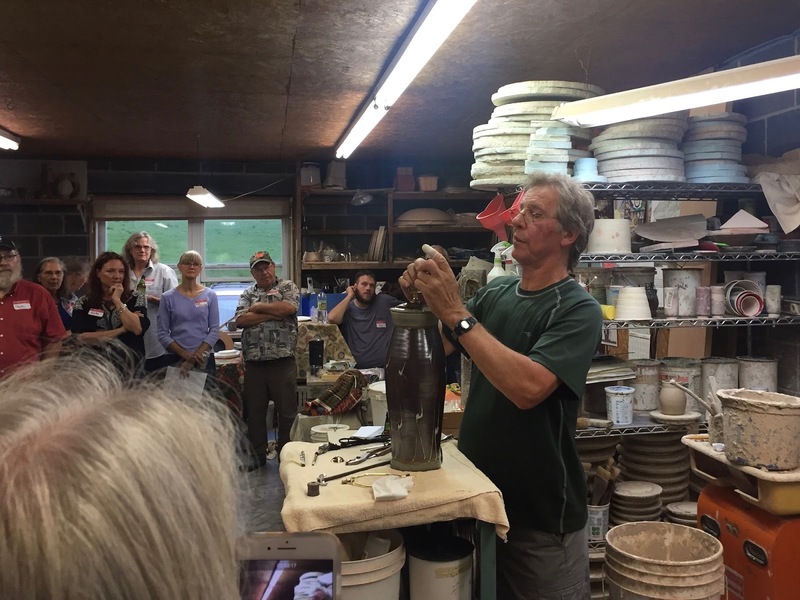 Clay Club is tomorrow at Rutkowsky Pottery near Burnsville. Thanks again to Ruth and Michael for hosting us! 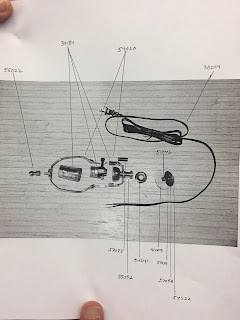 What: Michael is going to do a demo on how to wire a lamp. He will discuss how he makes his lamps on the wheel 'to spec' so the lamp parts fit nicely. Then he'll discuss the lamp parts he uses to make his lamps and how to order them. 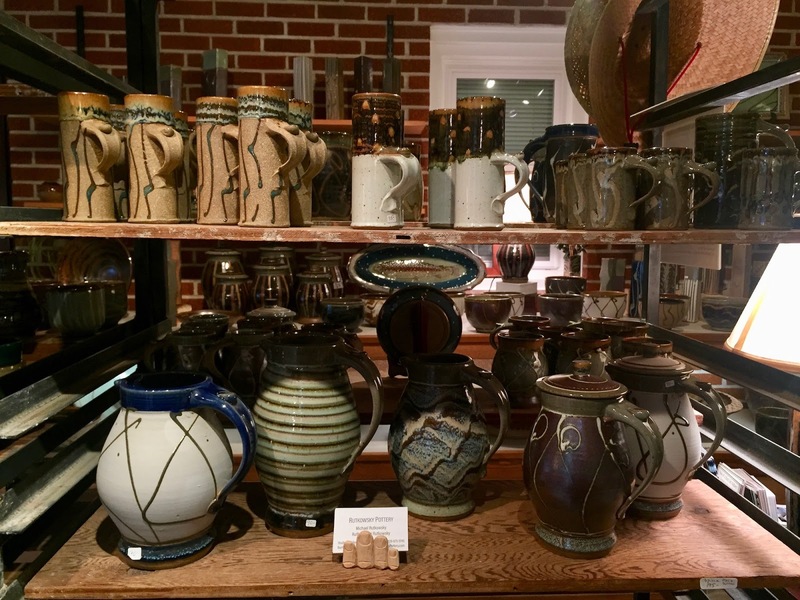 Where: Rutkowsky Pottery at 1489 Cane Branch Road, Burnsville (actually between Burnsville and Micaville). If you want to see what it looks like, go to the Bailey Pottery website....main extruder page and it is the Bailey 9 - the largest of the extruders. Takes a full bag of clay to fill the barrel. 11 large dies of varying shapes – some standard; some custom. $400 for the extruder, and all the dies. Studio in Waynesville, NC. Pick-up only. 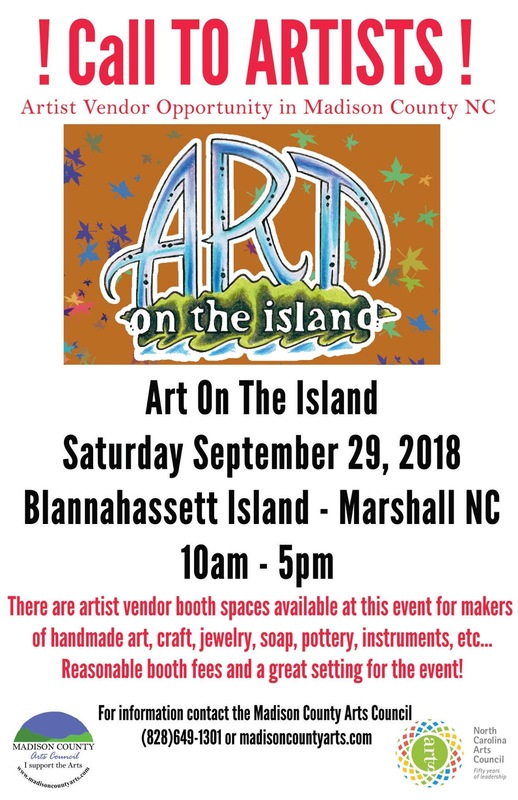 Artists wanted for Art on the Island in Marshall, North Carolina on Saturday, September 29th from 10am - 5 pm. 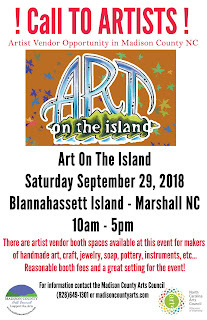 Booth Fee: $50 for Madison County Arts Council (MCAC) members; $85 for non-members. 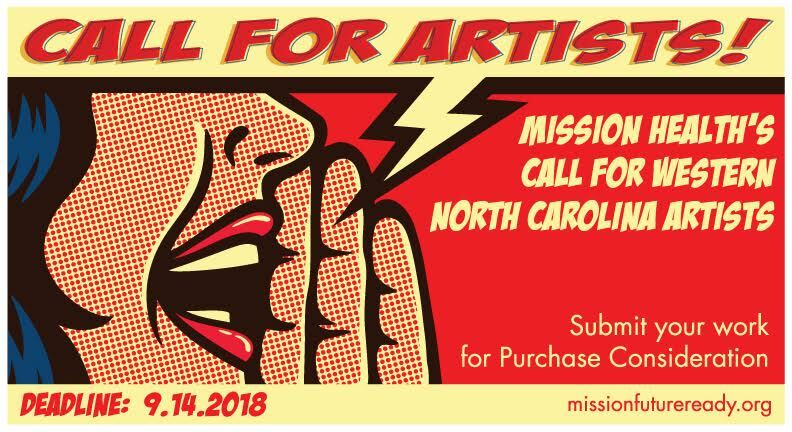 Applications due to the Madison County Arts Council office no later than September 14, 2018. 2018. If you are NOT already a member, apply before September 4, 2018, pay $85, and get a booth and a one year membership. Applications received after September 1st will be charged a flat fee of $85, which will NOT be applied to membership. 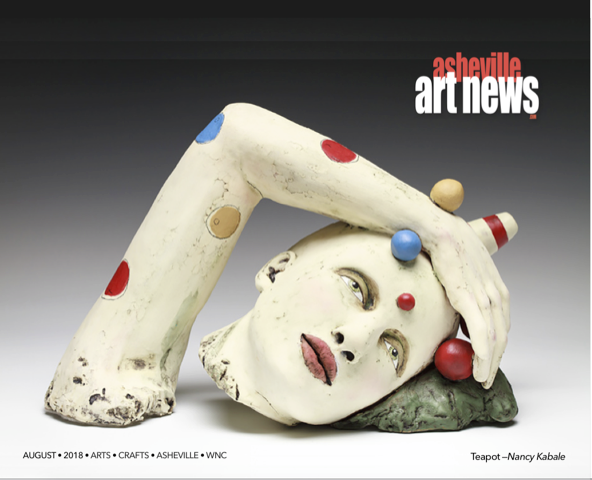 It is up and running, and now both Asheville and WNC readers, and visitors, have access to comprehensive Art & Craft event information which previously could only be found by dredging through numerous websites. 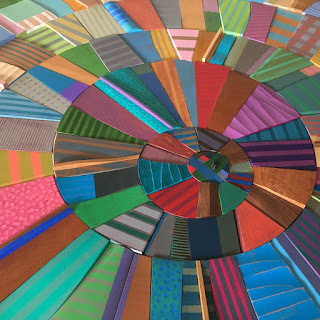 Posting to this calendar is both open access and free to Artists, Galleries, Exhibitions, Art Walks, Studios, Schools and Classes, Associations, and Open Houses . . . everyone who promotes Arts & Crafts. If this sounds altruistic, it is ... we want the emerging artist or crafter, as well as those established, to have the opportunity to be seen. The success of this site is largely dependent upon the willingness of people who make and/or sell art to take an active role in entering their events so that their customers or clients (some yet unknown) can attend, or make plans to attend, an opening, exhibition, etc. All the bells and whistles are yet to be connected. It is functional and you can “occupy your dates” well in advance of an event. 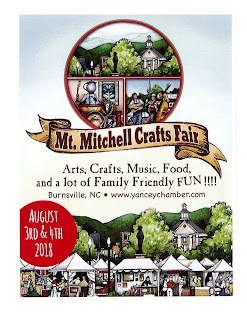 The 62nd Annual Mount Mitchell Crafts Fair is held on the Town Square in Burnsville, NC on the first Friday and Saturday of August. 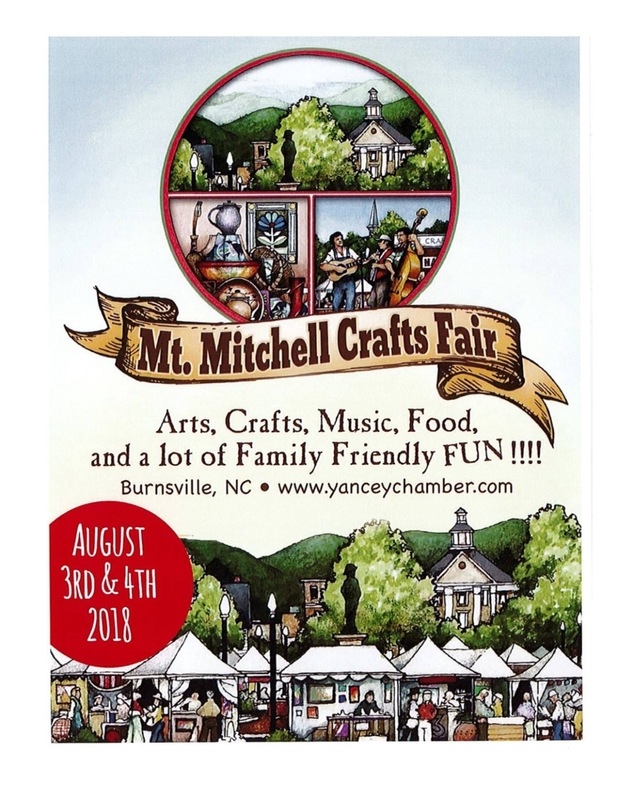 With approximately 200 juried crafters, this event more than qualifies as a craft shopper’s paradise, as evidenced by the over twenty thousand people who attend this event each year searching for those special, one-of-a-kind items created by artisans from across the Blue Ridge. 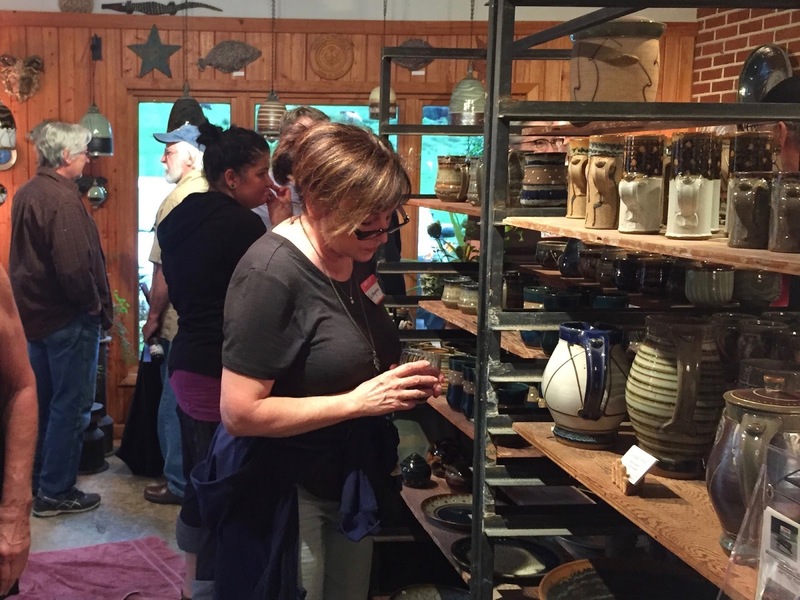 Shoppers browse a wide selection of items, including handmade quilts, jewelry, hand-turned wooden household items, pottery, art fabrics, rustic furniture, traditional mountain musical instruments, blacksmith creations, candles, soaps & lotions, and artwork of all mediums. Have a seat and watch as the artisans produce their craft throughout the day. Enjoy a lunch of southern favorites such as barbeque and sweet tea on the square as you listen to the live music and entertainment or perhaps try to keep up with the cloggers and other dancers as they kick up their heels on the stage. Step back into the past as you enjoy an old-fashioned Town Square event that exhibits Southern Hospitality at its best.